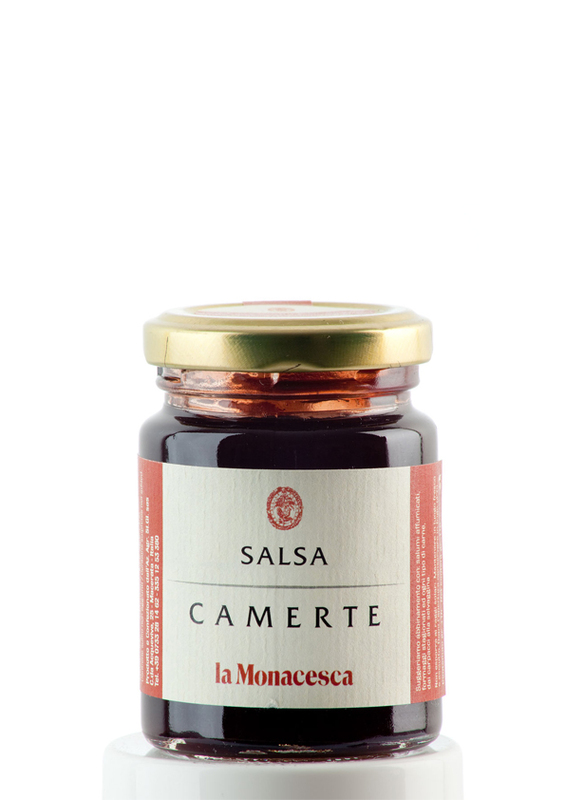 AN IDEA: Create a wine sauce that will be richly – flavoured, well-balanced, and delicious, but will at the same time be unique, preserving the particular sensory characteristics of Camerte, a sauce that can be used in a wide range of food combinations and dishes, giving them that personal touch, to surprise even the most innovative and curious palates. PREPARATION: A sauce obtained by the light reduction, in an open saucepan, of Camerte, after pre-maceration in aromatic herbs and spices, with the objective of preserving intact the unique qualities of the wine. Does not contain alcohol. DESCRIPTION: Aromatic sauce, with a smooth texture, an intense ruby red in appearance, with an initial tangy, acidic impact, then perfect balance with the sweetness of the herbal and spice fragrances, with surprisingly lengthy, complex flavours from the wine’s tannins, concluding with a wine-like nish that is emphatic and very pleasurable. USES: Wonderful with meat dishes such as strips of beef (especially with juniper berries), braised or baked lets, medallions of beef, but also with fattier meats such as pork. Perfect with wild game, such as venison, duck breast, or guinea fowl. Delicious when brushed on boiled fish. Try it on antipasti and charcuterie, on grilled vegetables (eggplant and radicchio), with spiced lardo, guanciale, and hot crunchy pancetta. Or at dessert on pears or caramelised figs.